Milkweed Poisoning in Horses: What is the Risk? With the recent deaths of 19 horses in Colorado, USA as a result of milkweed poisoning, we’ve going to take a look at the just how dangerous milkweed and the milkweed poison is to horses. Milkweed is most commonly found throughout the USA, so fortuantely for us here in the UK, Europe and elsewhere, we generally have little worry about when it comes to milkweed poisoning. We’ll be taking a look at the genus Asclepias (milkweed), which contains around 140 different milkweed species, (fortunately, not all species are toxic). The most toxic milkweed species however, is ‘Whorled milkweed’. A s mentioned above, there are around 140 species of milkweed, some are toxic, some aren’t. However, Whorled milkweed contains an extremely toxic neurological poison. Whorled milkweed may sometimes be referred to by its latin name, Asclepias verticillata. Milkweed has only a few uses; one of the more interesting uses is that it is grown commercially for filling hypoallergenic pillows. Its other primary use is in butterfly gardens, as it acts as a food source and habitat for the monarch butterfly. It is not common for livestock or horses to consume milkweed as it is highly unpalatable. The plant itself stands around 3 to 4 feet tall and leaks a milky sap when the stem is broken. The toxic Whorled milkweed is shown to the right. 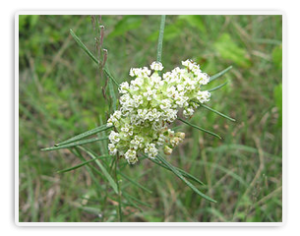 If a leathal dose is consumed, death can occur within 24 hours for both toxic milkweed species and Whorled milkweed. The reason for difference in symptoms is that Whorled milkweed contains a different toxic to the other toxic milkweed species. Whilst some milkweed species contain cardiac glycosides (a naturally occuring, sugar derived molecule that is used in human medicine to treat heart failure), Whorled milkweed contains an unidentified neurotoxin that is much more potent. This means that a toxic dose of milkweed may be as little as 300g (Whorled milkweed) or as much as 9,000g for a 500kg horse. All parts of the milkweed plant are toxic, so this includes the leaf, stem and flower and milkweed retains toxicity even when dried. This means that precautions still need to be taken when feeding baled hay. As there is no antidote for milkweed poisoning, the owner of any horse suspected of having ingested the plant should seek assitance from their vet. 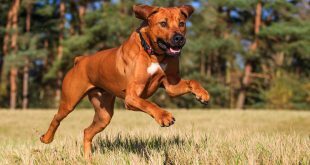 The vet will limit further absorption of the toxin from the gastrointestinal tract. 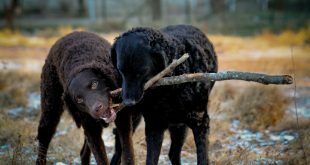 Because milkweed is highly unpalatable, it is unlikely that a horse will eat it through choice, however, there are a few simple steps that owners can take to reduce the likelihood of milkweed poisoning. Horse owners should check the pasture for milkweed (and other toxic plant species or toxins) and remove the whole plant (root included) if found. It is also recommended that herbicides are used, following the manufacturer’s guidelines. Ingestion of milkweed is most common when the plant is dried and baled. As such, horse owners should be vigilant of the contents of hay when feeding. The finer stem of milkweed makes it difficult for the horse to find and pick out. Overall, the risk of your horse actually ever experiencing milkweed poisoning is low to moderate. The plant is unpalatable, only really found in America and requires large doses to be considered toxic. However, recent events have shown that it is possible for horses to succumb to poisoning. 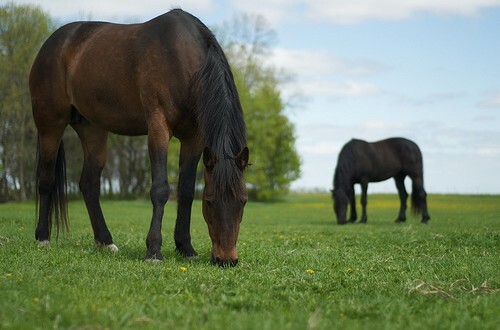 In general, horse owners should be aware of which plants pose a toxic risk and regularly evaluate the pasture for the presence of these species. See here for an idea of which plant species are poisonous to horses.